Happy New Year! What are your resolutions? Or, have you decided to trash the resolutions and just do your best everyday? Maybe last year’s list has turned into this year’s desire to be a kinder human being, or more giving. Here at Coastal Connecticut Research in New London we are grateful each day for those who come forward to participate in research. Our study volunteers give their time to help develop better treatment options for a variety of conditions. In 2018 many came forward to test study products for conditions such as hot flashes and night sweats, decreased sexual desire, migraine headaches, Alzheimer’s agitation, stress urinary incontinence, diabetic foot pain, multiple sclerosis walking impairment and more. 2019 is another year that holds much promise as we continue to help to move medicine forward one volunteer at a time. Are you curious about research? Would you like to learn more. Call us! (860)44304567 or email marylou@ccrstudies.com. How do I know if I have an overactive bladder? What is an overactive bladder? Is an overactive bladder a healthy bladder? These questions and others were addressed recently as part of the CCRstudies speaker series. 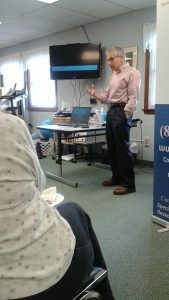 Our inaugural event featuring Dr. Robert M. Spitz as our speaker was held at Shoreline Physical Therapy in East Lyme, Connecticut. 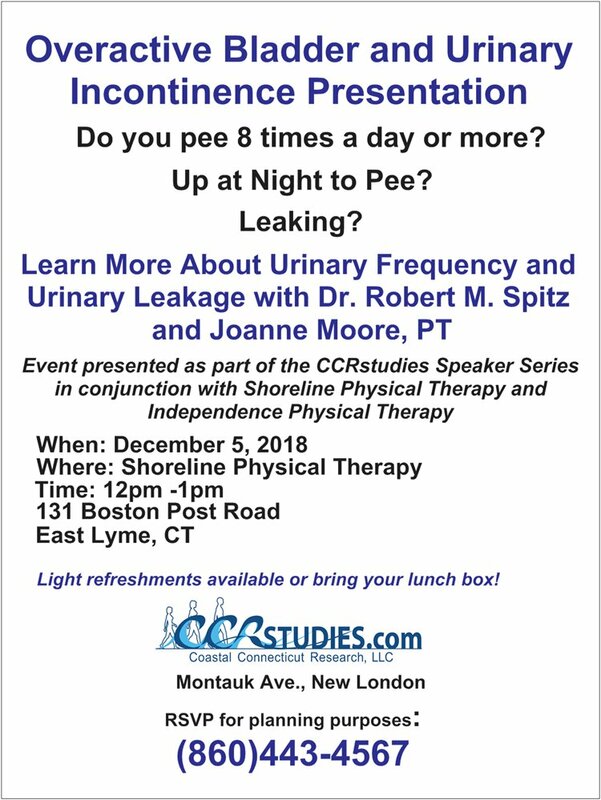 Dr. Robert Spitz, primary investigator of our current OAB research study and Medical Director of Coastal Connecticut Research, discussed OAB, urinary urgency and incontinence issues at a lunch and learn held in early December. Those in attendance, both women and some men, came with questions and were seeking to be better informed about this condition. Joanne Moore, PT and proprietor of Shoreline Physical Therapy also addressed some techniques to address OAB regarding biofeedback and physical therapy. The event provided some vital information to those in attendance. Thanks to Joanne Moore for her hospitality and to those who attended this event! CCRstudies is proud to announce our new educational and informational speaker series. Dr. Robert M. Spitz, medical director, will kick off our speaker series at 10am on Tuesday, November 27th at the New London Senior Citizen’s Center, 120 Broad Street in New London. Dr. Spitz will discuss how menopause can affect a woman’s libido. He will also highlight research in this area. To learn more about this discussion or how you can book an event, contact MaryLou Gannotti at (860)443-4567 or email marylou@ccrstudies.com. No Tricks Here! C’mon Ghouls! Calling all ghouls, goblins and witches! Are you spooked about clinical research? Afraid there are more tricks than treats involved? Don’t worry! At CCRstudies in New London, we conduct clinical research studies with an adherence to ethical standards and practices. All study-related care, labs, exams and testing is available at no cost and no insurance is needed. Not everyone understands the premise behind clinical research. We are among thousands of sites throughout the US and the world involved in changing lives through research. By volunteering for a clinical research study, you are evaluating a new treatment option for a condition or disease that otherwise might not be available. Or, you may be evaluating a study device. Some research studies are observational and do not involve medication or devices. Through the clinical trial process in the United States, study products currently being evaluated may ultimately become available to the general public. If you or your “mummy” wish to learn more this Halloween season, please give us a ring at CCRstudies in New London. (860)443-4567. Are you interested in learning more about why some females have decreased sexual desire after menopause? Or maybe you would like to learn more about urinary incontinence issues such as stress incontinence or urge incontinence. In layman’s terms, that means do you feel the sudden strong urge to pee that you just can’t control or do you leak? Dr. Robert M. Spitz, board-certified OB-GYN and medical director of Coastal Connecticut Research, will be presenting on such topics throughout the community this fall. Our site is proud of our efforts to educate the local community on issues relating to healthcare, clinical research studies and over all well being. We are happy to visit senior centers, health care facilities, municipalities and other places where we can share information with you on a variety of topics. If you wish to learn more call MaryLou Gannotti at (860) 443-4567 or email marylou@ccrstudies.com. Autumn is upon us! The hectic pace of summer has been replaced by the relaxed pace of autumn. October is typically a lovely month here in Southeastern Connecticut with the opportunity to still enjoy all our lovely coast has to offer! At Coastal Connecticut research, this autumn has us focusing on clinical research studies evaluating study products for MS walking impairment, Alzheimer’s agitation and Overactive Bladder. Information on upcoming studies will be shared as we prepare for enrollment. Those interested in learning more are always encouraged to contact our site and speak to a member of the CCRstudies team at (860) 443-4567. Caring for a loved one with Alzheimer’s requires a tremendous amount of time, energy, patience, empathy and compassion. But what happens to the caregiver when their loved one becomes abusive, verbally combative, and generally difficult? Alzheimer’s disease does not just encompass memory loss. Many of those living with Alzheimer’s will also develop agitation. This difficult behavior can include repetition, mood swings, verbal combativeness, resistance, hitting, spitting and throwing things. Some caregivers find themselves being hit or swung at. Pacing and aimless wandering may occur, rocking, pointing fingers, and overall restlessness can make for a tremendous amount of stress and tension in addition to the other already difficult scenarios Alzheimer’s can present. Over half of those living with Alzheimer’s will develop agitation. This behavior may seem out of character and extreme but is not uncommon. These symptoms can be a sign the Alzheimer’s disease is getting worse. Research is underway involving Alzheimer’s patient living with agitation and their caregivers. Dr. Laurence Radin and Andrea Stewart APRN are among the investigators working on a study locally. Those who wish to learn more about Alzheimer’s agitation and Alzheimer’s research are welcome to call Coastal Connecticut Research in New London at (860) 443-4567.